The new PS4 Aim controller releases today bundled with Farpoint, a game by Impulse Gear that provides players with a chance to traverse an unnerving alien world searching for survivors, a way home but ultimately a chance to shoot giant alien bugs in the face. Farpoint provides PlayStation VR owners a solid reason to hang on to their investment, and although the new controller, PS4 camera and headset set you back a few bob, it's still the cheapest way to experience VR and Farpoint goes a long way to convince publishers and punters alike that there's something to be said for gaming with a headset strapped to your gawping mug. The plot sees the main character separated from fellow astronauts Eva & Grant after piloting a shuttle a tad close to an impromptu wormhole. Players find themselves on the other side of the Universe searching for holographic logs scattered throughout an alien landscape. 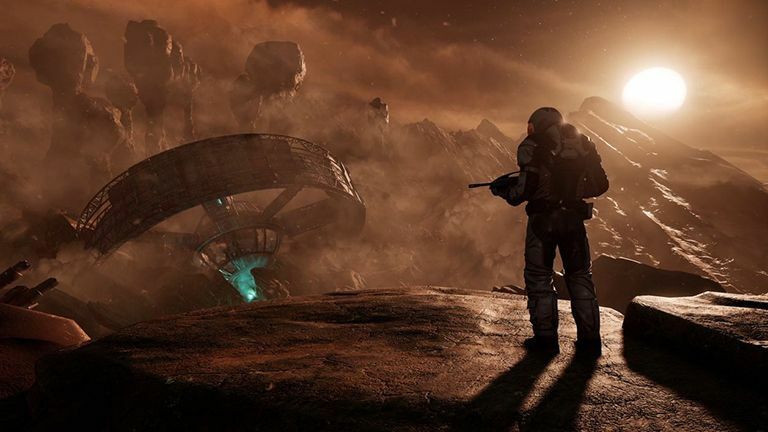 In order to reunite with the scientists and escape home, players must explore and discover the secrets of the planet. Movement and direction controls are mapped to the PlayStation VR Aim Controller itself, with all the functionality of a PS4 DualShock on display. It may look slightly ridiculous with its front-mounted pink motion-tracking ping pong ball, but none of that matters in VR as Farpoint offers a multitude of weapon types that map to the physical dimensions of the controller. Each are exceedingly satisfying to hold, examine and - of course - fire, creating a sense of empowerment. With gun in hand you'll wade forward into the hordes of indigenous and alien life as you keep moving (always forward) to survive the planet and create a pulpy alien mess in your wake. Enemies vary from over-sized insectoid cannon fodder to massive multi-storied behemoths which require obligatory weak spots to be destroyed with ever depleting explosive ammo. Graphical fidelity is where PSVR can fall over, and whilst the visuals will impress, Farpoint's environments will begin looking a little barren after the first hour. But see the six hour story through and you'll be relieved you did so as environments open up and some solid sci-fi influences can be felt. We couldn't help but wonder what terrors we could have enjoyed if the arachnids had been swapped out for a licensed form of alien of the Giger variant, or even the B-movie antics of the Starship Troopers brand. Farpoint is designed to be played standing but T3 recommends pulling up a pouffe as it's easy to feel a bit wobbly when virtually legging it around to avoid projectiles and leaping hostiles. That being said, we found that extended play sessions were surprisingly nausea free, a real achievement over some recent VR only releases. Find yourself a friend with their own set-up, and you'll be able to experience the two player network play, not essential but immensely fun. Just remember Farpoint nudges at the boundaries, rather than pushing them. Either way, the game offers a satisfyingly immersive and explosive experience that's currently exclusive to PlayStation VR, one with a controller that benefits from a quality of build that sports traditional Sony flair. For more information about Farpoint and the PlayStation VR Aim Controller then head on over to the game's official website now.